This year, I bought myself an Nvidia GeForce GTX 970 graphics card. It was time to upgrade. And I was pleasantly surprised to find I could buy a mini version of one of the best cards ever made. Now, I can potentially fit my beefy gaming PC into a console-sized case. But a new card from AMD is about to do small and powerful even better. You’re looking at the new AMD Radeon R9 Nano. Don’t judge it by its size! This is one of the most powerful graphics cards you can buy. 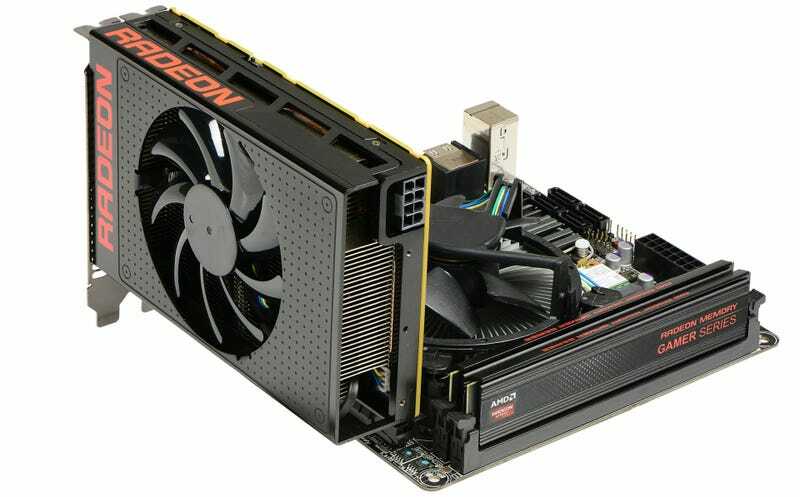 AMD says it’s roughly 30 percent faster than an AMD Radeon R9 290X—one of last year’s best—despite being a full 40 percent shorter. Yep, sure looks like it’ll give my existing GPU a run for the money. Mind you, those framerates were measured with a crazy powerful Core i7-5960X processor, 16GB of DDR4 memory... generally a system that you probably wouldn’t want to stuff into a small box that lives underneath your 4K TV. There’s no guarantee you’ll get playable maxed 4K games if you stick the R9 Nano into a weaker gaming rig. Like mine, for instance. But then again, you probably won’t be considering the R9 Nano at all unless you’ve got some money burning a hole in your pocket. It’ll retail for $650—the going price for Nvidia’s muscular—and larger—GTX 980 Ti, and way more than I paid for my mini GTX 970. You can probably get more frames per second for less money with a different card if size isn’t a priority. Still, if you’re looking for a card that fits into practically any dual-slot case and plays your games with ease, this is the most power you can get right now. Look out for reviews of this diminutive beast over the days and weeks to come.